HSLDA launched HSLDA Online Academy in 2009 as a service to homeschool and private school families looking for ways to supplement their students’ high school education. 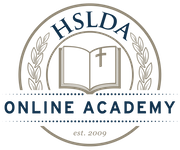 Today, the Academy operates as a division of HSLDA dedicated to providing quality Christian online courses to students everywhere. Since our inception, we've had students from all 50 U.S. states and over 10 countries around the world. Our main office is located in Northern Virginia, and we have the pleasure to work with an exceptional team of teachers who work remotely in various U.S. states. Here are a few testimonials from our teachers! We teach our courses from a distinctly Christian perspective. We have a selective teacher-hiring process and work closely with our employees to help them grow as teachers and professionals. Our courses include live, interactive class sessions—which not every online program provides. Our rigorous coursework helps students build a strong academic foundation. We combine the flexibility of independent study with the community of classroom learning. Our courses are competitively priced.